The foundation for Claymore was established in the year 1987 when Bobby Butts, a son of a Scottish soldier, founded "The Bobby Butts Band". His aim was to connect the music from his father's homeland with a solid Rock pattern. 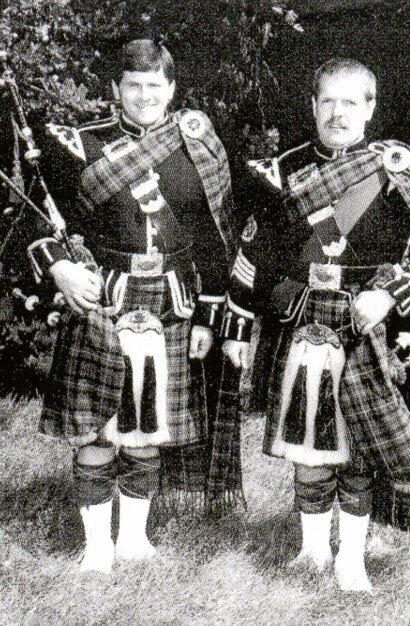 In 1990 the band changed its name to "Claymore", a suggestion made by one of the pipers at that time, Mick Maitland. In the following years the band started to develop and finetune their style of music, mainly inspired by ancient Scottish saga's and important historical events. A lot of inspiration was found during many visits to the North of Scotland. Many of those songs can be found on the numerous CD's the band recorded, each of them showing more and more the definite direction the band wanted to go to. Claymore started to become well-known, made some Television appearances and treated their concertaudience with specially built stage presentations like "the Stronghold" and "the Fregate", performing for usually enthousiastic crowds and building up a solid and very loyal fanbase. In 1999 the band was suddenly shaken by the untimely death of Bobby Butts, the original founder-member of the band. Apart from the personal tragedy, the band not only had to look for a drummer, but also the inspiration and productional knowhow was dearly missed and again, the band had to start searching for directions. Luckily Martin Otte, drumkit student from Robert Butts and sidedrummer with Claymore was able to fill the spot. Together with Gerald Schmiechen on Bass, who joined the band, after Michael Göttling had left, they formed a solid rhythmical foundation for the band to work on. In 2003 the band recorded their CD "The Northern Call" which was presented during a concert in Heiligenhaus for over a 1000 enthousiastic fans. The live registration of this concert was released as a DVD in December 2004. In 2008 Claymore started the proceedings to record their new CD "The Castle", but had to postpone and later cancel the recordings due to the illness of longserving member and guitarplayer Hans Homann. Several attempts were made to operate on a reduced basis, but in 2011 the difficult decision had to be made to "stop sailing the ship"; it seemed Claymore had made its last voyage... Also drummer Martin Otte was no longer available due to his professional obligations. Initiated by Volker Sauer's son Florian, Claymore found, after a 6 years' break, the right spirit to "sail the vessel" again. Now with Florian Sauer on Drums and Chris Johne on Guitars, Claymore is determined to, not only reproduce the music from the past, but also look for new directions and probably start recording new material. The return of the band has been well received by their very loyal fanbase during the first engagements in Essen-Kettwig and Solingen in October 2017. Thus giving the band enough energy and inspiration to face the future with lots of trust & confidence!